In the beginning... Morriston Rugby Club Male Voice Choir (Côr Rygbi Treforys) is one of the youngest premier Welsh Male Choirs, with a hard-earned reputation for a very high standard of performance. The Choir was formed in 1979 by twelve members of Morriston Rugby Club with the intention of forming a small social ensemble to sing while hosted by various rugby clubs after attending rugby internationals. It soon developed into a fundraising choir, entertaining in small venues for local charities and residential homes. As the years have passed the membership has increased to become the musical force it is today. The primary aim of the Choir is the singing of choral music and the presentation of public concerts to aid and raise funds for charitable institutions. Their repertoire (in English, Welsh, and some foreign languages) is wide-ranging and varied, encompassing sacred music, operatic arias, traditional Welsh hymns and airs, musical show numbers, etc. The Choir is a registered charity and does not charge for its charitable performances, with the exception of sharing travel expenses when a coach journey is required, and covering professional music staff fees. The popularity of the choir is reflected in the many invitations to perform at prestigious venues around Britain each year, including several appearances at massed choir concerts in the Royal Albert Hall. In 1999 the choir was involved with the Rugby World Cup, and was invited to perform at the opening and closing ceremonies at the Principality Stadium, Cardiff (formerly known as the Millennium Stadium), and it also featured on the official CD of this event, singing the theme song "World In Union" with international artistes Bryn Terfel and Shirley Bassey. In January 2000, the Choir celebrated its 21st Anniversary with a gala concert at the Brangwyn Hall, Swansea, compered by Richard Baker. In July 2003, the Choir had the honour of being invited to perform in its own right at The Royal Albert Hall in a "Gala Evening" to celebrate the Diamond Jubilee of the Fire Services National Benevolent Fund, a wonderful and memorable experience for all those who took part. In 2016 the Choir won 1st Prize at the Aberteifi Eisteddfod. The Choir has undertaken several tours to various European countries, and one of the most memorable was representing Wales at the 10-day 2012 InterCeltique Festival in Lorient, Brittany, where their Musical Director D. Huw Rees had the honour of conducting the massed participants (including many pipe bands) in each finalé of the five late-night stadium extravaganzas. Their most recent foreign tours were to the Mosel region of Germany in May 2016 (their first visit to that country), and to Flanders in 2017, where they sang at the nightly commemoration at the Menin Gate in Ypres, and in Lille Cathedral. The town of Morriston has a population of 17,000 and still remains a distinct and separate part of Swansea, with the iconic spire of Tabernacle Chapel as its focal point. This chapel, known as the "Cathedral of Welsh non-conformity", is also the venue for the Choir's annual concert each May, and for the recording of its CDs. The Choir is truly representative of the Morriston area, with over 90% of the choristers living within the Morriston catchment area, and it is committed to encourage young musical talent within the community, involving local primary and secondary school choirs and soloists to give young performers the experience of a wider audience. The choristers range from youngsters up to seniors of ninety-plus, and they come from all walks of life. There are teachers, engineers, students, barristers, office workers, workers in industry and several retired persons, but they all have one thing in common - their love of music. Almost all the members are from the Morriston area, which is unusual, as most choirs have to go much further afield to recruit choristers....Go to page. When the Choir was first formed, the dress was navy sweaters and grey trousers, and this continued to be the uniform for several years until they went on their first visit to the Royal Albert Hall and found that they were the only choir on stage without jackets! It was later decided to purchase blazers, which then became the number one dress. In May 1999 the choir appeared on stage at their annual concert in dinner suits, and in 2012 they debuted their new Welsh Pride plaid waistcoats and ties at the Lorient InterCeltique Festival. Depending on the type of concert, venue, and weather, the dress is now chosen from these three formats. Symbols on the Badge - 1. St John's Church, 2. Castle Graig, 3. Link with Rugby. 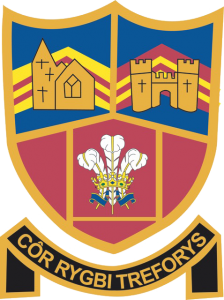 The badge is almost identical to that of Morriston Rugby Club, which celebrated its 125th Anniversary in 2001; the only difference is that the words “Morriston RFC” have been replaced by “Côr Rygbi Treforys”. The symbols on the badge have strong connections with Morriston, because in 1726 a Shropshire man by the name of Robert Morris, an expert in copper smelting, bought a partnership in Llansamlet copper works at Landore. (1) In 1789 he endowed a temporary church on the site where St John's now stands. It is a focal point in Morriston as it stands in the middle of the main road and all traffic has to drive around it. In 1999/2000 The Church in Wales decided to close St John's because they could not afford the cost of its upkeep. The stained-glass windows were removed for safekeeping. (2) Castle Graig (Morris Castle) was built around 1750, again by Robert Morris, to house the workers and their families. It is not a castle, but probably the first block of multi-storey flats ever built; an early 19th Century account states that 20 families lived there, and its ruins are still a landmark overlooking the town. (3) The three feathers and rugby posts are the Welsh and rugby connections.